Material: outer 100% leather, lining 100% polyester. Dimensions (L x W x D): 10.5 x 7.3 cm. 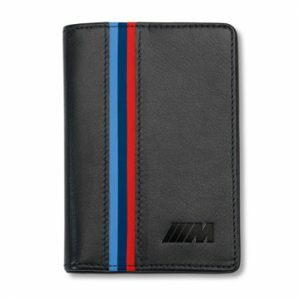 This sporty business card case is made of black nappa leather with inlaid leather strips in the BMW M colours and contains two card compartments. Exciting design elements include red contrasting stitching in the interior and an elaborate embossed BMW M logo on the front. Material: outer 100% leather, lining 100% polyester. Dimensions (L x W x D): 10.5 x 7.3 cm.